Love, Life, God by Jarrad Hewett (A Review) - How Will it Help You? I stumbled upon Love, Life, God quite by accident. I only wish I had found it sooner. It's been a long time since I've read a Law of Attraction book that has impacted me. Love, Life, God: The Journey of Creation by Jarrad Hewett is that book. It isn't your typical dry Law of Attraction book. 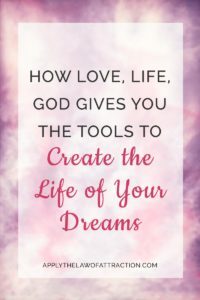 Love, Life, God is a humorous, engaging conversation between the author, Jarrad Hewett, and God that gives you profound insight into your ability to create your life. I felt like I was reading messages from a friend. Please don't let the title fool you. This book is not about religion. God is simply Jarrad's term for Source or the Universe. It represents the very creation energy that exists in you. While it is written in the same conversational-style as Conversations with God by Neale Donald Walsch, it's a completely different book. If you've never been sure why you haven't been able to manifest what you want, this book will help you get to the core of what is holding you back…and it will help you release it. Love, Life, God focuses on helping you to awaken to your true power. It's filled with love, insight and wisdom. There are a lot of real life examples that help you put all of the pieces of the puzzle together so that you can create your best life now. Love, Life God is an honest, heartfelt book that shows you how to apply the Law of Attraction to your daily life. It gives you the tools to create your dreams – no smoke and mirrors, nothing hidden. Note: I did not receive a free copy of this book or any other form of incentive for writing this review. I'm sharing it because I really do think it is that wonderful. My opinions are 100% honest. Jarrad Hewett truly deserves credit for his amazing work. What Happens After Your Desire is Fulfilled? Halfway through this book and , Wow…. Thank you for the recommendation Elizabeth ! Yes, I finished it, and the part that really resonated was that there is often a part of us that doesn’t know what we would do if we really got what we asked for. It’s a big part of the resistance you’ve discussed in your articles.